I drove a truck many yrs ago with a L-10 300 HP. I thought it was a solid little engine...gave no trouble at all....good fuel mileage and the Jake was respectable as well. Be careful when you follow the MASSES......sometimes the "M" is silent. A friend of mine has a L10 in one of his dump trucks and maybe 5 years ago I add about 20 psi to the rail pressure and he has no problem yet.I believe it was a 300 but he was only driver on it him self.There was two versions of this engine and I would only want the one which has the exposed dampener instead of the inclosed damperner.Some 10 engine was celect also. The potential torque on the L-10 sheet at over 900 lb. ft is equivelent to a 9 cylinder 71 series .............or an 8V71T or 6V92T. 6V92T should be equal , fuel and torque wise. I had the 300hp L10 in a Pete 320 Front Loader (rubbish truck) that was excellent compared to the DV550 and Cat 3208 we had previously. Well, actually I am going with the L10.But I read a lot of overdrive magazines from back in the day. & The Detroit was one of the smaller but popular sized engines from that time. 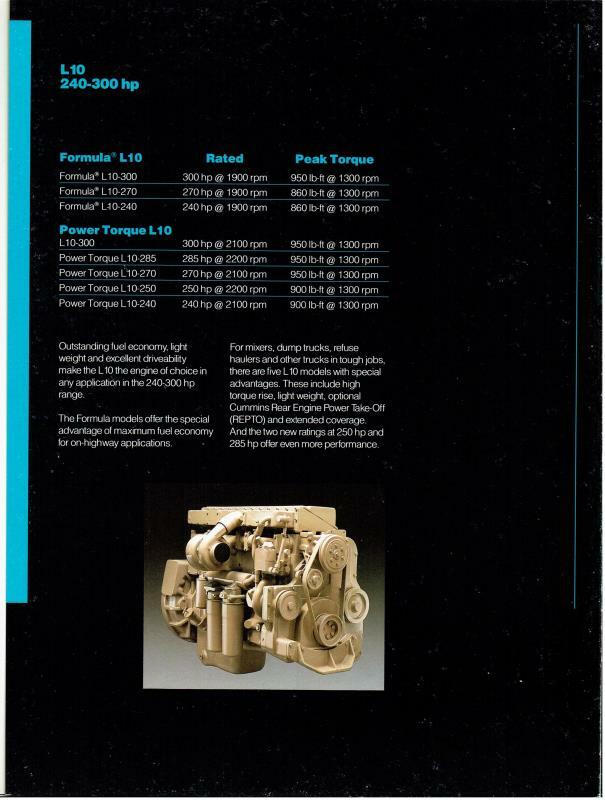 & I just wanted to see if a L10 could be comparable because both are about the same size.Thanks, I am not a fan of Detroit diesel, just needed to see if they could compare. L-10 will get better milage, the Detroit will have a bit more power. I have some seat time behind a L-10 and was impressed how well it did for its displacement. I guess it depends on what you want, what is important to you. If I were looking to make a living with one or the other, I would go for the L10, If it was in a old truck that I wasn't going to work, the Detroit is more attractive. I am curious, how would a L10 cummins compare to a 8v71 Detroit?I know both are slow. But in terms of reliability, fuel economy,etc.